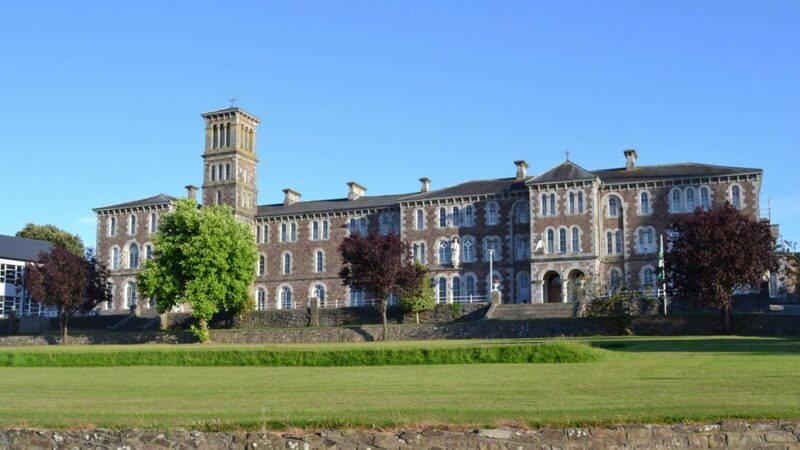 One of the most important strengths of St. Colman’s College is its unique ethos of care and counselling for all students. “Big enough to cope but small enough to care” would be an apt description of the almost family atmosphere nurtured in the College. 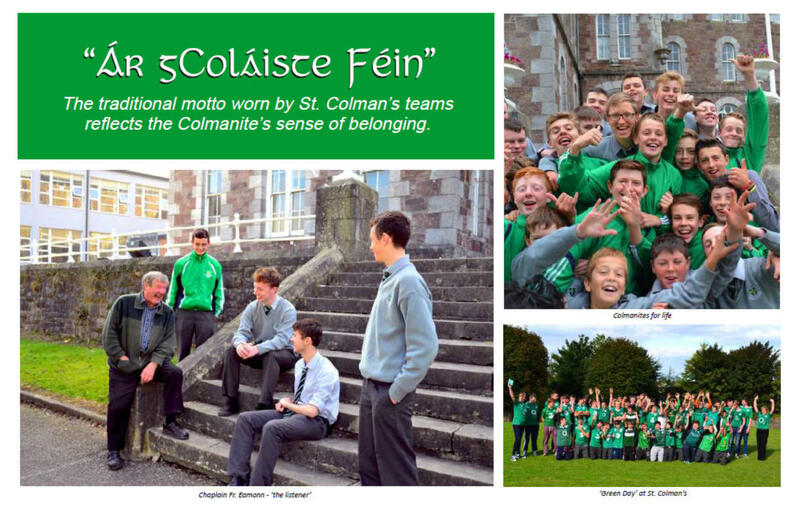 The boys proudly become ‘Colmanites’, quickly developing an identity all of their own and experiencing a unique sense of belonging. Our Chaplain, Fr Eamonn, is on hand each year to meet and greet the new first years, helping them settle in. We have very strong social and sporting links with local primary schools which facilitates the smooth transition from Primary to Post- Primary. Our guidance counsellor, Ms. Patricia Kiely, gets to know the students on a one-to-one basis as a large amount of time is allocated to meeting students individually. This assists them in many ways: subject choices; study techniques; aptitude testing; CAO and UCAS applications; college/university open-day visits. The guidance service also provides an opportunity for the boys to discuss their academic progress as well as chat about any personal challenges they may be facing in their lives. As the saying goes, "Find a job you love and you'll never have to work a day in your life", very relevant when students are making their subject choice for leaving certificate. Choosing subjects in which they have a keen interest gives them a greater chance to excel. There is a great variety of careers being pursued by our recent graduates, testament to the organic way in which students are allowed to carve out their own path when choosing their third-level options. We place great emphasis on listening - whether it is during the first few days here or the last few hours. We listen to the boys' anxieties and ambitions so that we deliver a guidance, counselling and pastoral care service that is both student-centred and student-specific in its outlook. Class teachers supported by a dedicated S.E.N. team work together to ensure that students identified as having special educational needs receive the support they require in order to achieve their full potential. The support provided follows consultation with the student, parents, teachers and outside agencies such as N.E.P.S. and N.C.S.E.A. A Personal Pupil Plan may be put in place, which outlines the type and level of support which helps to access a broad, balanced and differentiated curriculum to achieve success. The range of supports in place include: tuition classes, resource teaching, computers and assistive technology, reasonable accommodation in exams, tailored curriculum, subject exemption, access to special needs assistant, mentoring. In St. Colman’s . . . we care. "The level of care, allied to encouragement, shown to students is obvious and there is a sense of being listened to when there are struggles. Similarly there is mutual rejoicing when boys achieve. As parents, we always felt listened to, supported and welcomed at all times in St. Colman's"
Successful communication is a two way street and listening is a vital part. In St. Colman’s College, quality prompt feedback is communicated to students while self-assessment and peer-assessment is also promoted. In line with our continuous assessment policy, parents receive a quarterly update of their son's progress. This gives students ample time to set themselves targets and provides teachers and parents with sufficient time to support the student in setting attainable academic goals. Similarly, College staff are on hand to discuss and deal promptly with any issues or queries from parents at the regular parent/teacher meetings and at information evenings.